Honor caps triumphant month for Art Education faculty member, who also earned a U.S. Artist fellowship. Pepón Osorio, Laura Carnell Professor of Community Art at the Tyler School of Art at Temple University, has earned the 2018 Distinguished Artist Award for Lifetime Achievement from the College Art Association (CAA), joining a small group of past winners that includes many of the most influential American artists of the past century. Osorio is the first artist of Puerto Rican descent to receive the award, which will be presented in Los Angeles on Feb. 21, the first day of CAA’s Annual Conference. CAA’s press release announcing the Distinguished Artist Award for Lifetime Achievement cited Osorio’s “meticulous installations incorporating the memories, experiences and cultural and religious iconography of Latino communities and family dynamics,” noting the influence of his childhood experiences in Puerto Rico and his service as a social worker in the Bronx. Past winners of the award include Hans Haacke, David Hammons, Ellsworth Kelly, Jacob Lawrence, Yvonne Rainer and Nancy Spero. Cahan urged Tyler alumni and friends attending the conference or living in southern California to join her, Osorio and fellow Tyler faculty and staff—including Lisa Kay, Art Education chair; Mariola Alvarez, Art History faculty member; and Robert Blackson, Tyler’s director of exhibitions and public programs—at the CAA Convocation when the honor will be awarded on Feb. 21 (6 p.m.). The CAA Convocation will be held at the Los Angeles Convention Center and is free and open to the public. Cahan also congratulated the recipients of the other major 2018 CAA awards: Firelei Báez, winner of the 2018 Artist Award for Distinguished Body of Work; Kellie Jones, winner of the newly created Award for Excellence in Diversity; and Lowery Stokes Sims and Lynn Hershmann Leeson, winners of the Distinguished Feminist Awards. Pepón Osorio is best known for creating large-scale, densely-layered environments that capture the stories, dreams, and daily lives of real families. His collaborative projects have touched communities across the world, especially in the North Philadelphia neighborhoods near the Tyler School of Art, Osorio’s home as a teacher and scholar since 2006. His Philadelphia installations include “reForm” (2015-16, see above), a Temple Contemporary-commissioned collaboration with Philadelphia public school students, teachers, parents and neighbors impacted by the closure of nearby Fairhill Elementary School. 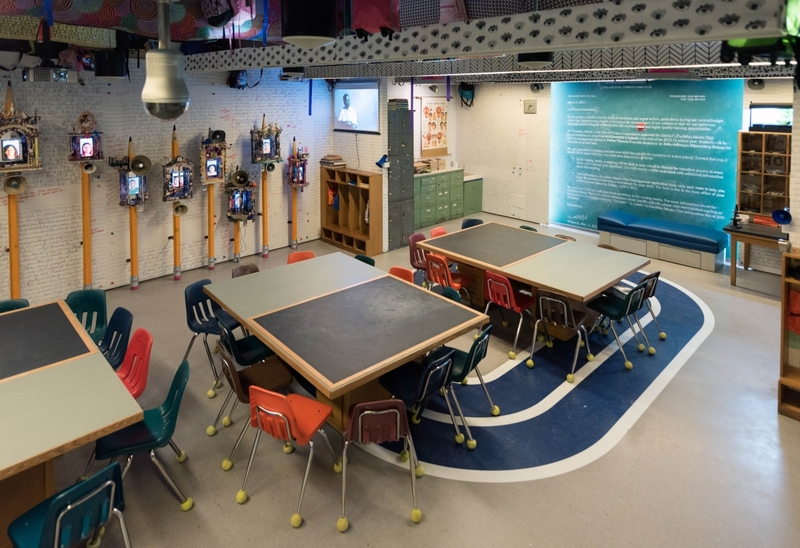 The project, culminated in the creation of a participatory classroom at Tyler made up of assembled objects from the abandoned school building (read “The wrenching effects of closing a school,” The New York Times, Aug. 8, 2015) and a series of free public programs tackling issues in education. His most recent work—“Side by Side” (2017), a site-specific installation at Cornell University in Ithaca, New York—is an upside-down house that tells the story of family whose world has been disrupted by the trauma of displacement. Osorio’s work has appeared in the Whitney Museum of American Art in New York (he was part of the landmark 1993 Whitney Biennial); El Museo del Barrio in New York (site of a retrospective); the Smithsonian American Art Museum in Washington, D.C.; the Bronx Museum of the Arts; the Yerba Buena Center for the Arts in San Francisco; Museo de Arte Contemporáneo de Puerto Rico in San Juan; the Africus Institute for Contemporary Art in South Africa (Johannesburg Biennale); El Centro de Arte Contemporáneo Wilfredo Lam (Bienal de Cuba); and many more. He is the recipient of numerous other distinctions including a MacArthur Fellowship (1999), a Skowhegan Medal for Sculpture (2001) and a Herb Alpert Award in the Arts for visual arts (1999). Osorio was featured in the inaugural “Art21” series on PBS. Last year, he received the Pennsylvania Governor’s Distinguished Arts award. When Osorio joined Tyler’s Art Education Department in 2006 as part of a wave new tenured and tenure-track faculty recruits at Temple University—an unprecedented faculty hiring surge that continues today—he had no higher-education experience. More than a decade later, he’s still growing as a teacher, fueled by his students and their energy. His current and former students share the sentiment. “Pepón Osorio—his community arts practice and the way he teaches—that’s the reason I came to Tyler,” said Tim Gibbon, who earned a M.Ed. degree with a major in art education from Tyler in 2015. Gibbon served as project director under Osorio for the “reForm” project as a graduate student.